The Lean Leadership Master Class is an opportunity to learn from one of the world’s leading lean management practitioners and trainers. 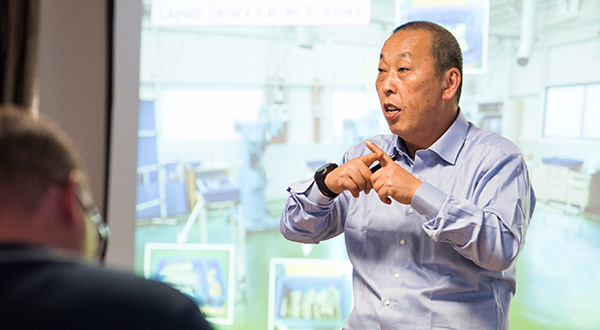 As a veteran Toyota factory manager and kaizen leader, Akinori Hyodo has built a 40-year career fostering the Toyota Production System within Toyota, its supply-chain, and more recently within non-automotive companies. The master class will be led by Hyodo Sensei, a former factory manager at the Toyota factory in Japan responsible for the manufacture of the HiAce vehicle. Now retired as a factory manager, Hyodo Sensei heads the Toyota Dojo (Toyota Group Training Facility) of HiAce factory providing lean training courses for companies in Toyota’s supply chain, and hosts the training component of the Shinka Management Kaizen Tour run in Japan. This training will be run in collaboration with the Waste Management and Recycling Association of Singapore (WMRAS) and presented by lean consultants Shinka Management. This two-day lean leadership training will focus on the application of lean principles and the Toyota Production System (TPS) to sectors outside of automotive, including application to the Waste Management and Recycling sector. The course will go beyond theory to discuss how lean thinking can be implemented and sustained within organisations. The course will also include an overview of the operations at the Toyota HiAce factory in Japan. For questions or information regarding registration, please contact us.